Earlier this month I was out in the back yard cutting the grass. Suddenly all around me there were dragonflies, darting, circling, dipping. I had never seen so many, merely the odd one here and there, and always in the front yard. The photo I feature here, by my wife Susan, is of one such insect that was basking in the sun and stayed still long enough on our front walk for the picture to be taken. I was so impressed with the sight of so many of these beautiful insects that I decided to try to find out if they meant anything special to cultures ancient and (post)modern. What I discovered was fascinating. In ancient Japan, the presence of dragonflies meant a good rice harvest; they were also believed to bring good luck in battle. In paintings, they represented new life and joy. They continue to be symbols of courage, strength, and happiness in contemporary Japan. Native American cultures also saw the insect as a symbol of life, featuring it on their ceremonial pottery. One story tells of a dragonfly made of corn and straw that came to life as a messenger of the gods and saved the people in a time of drought and famine. 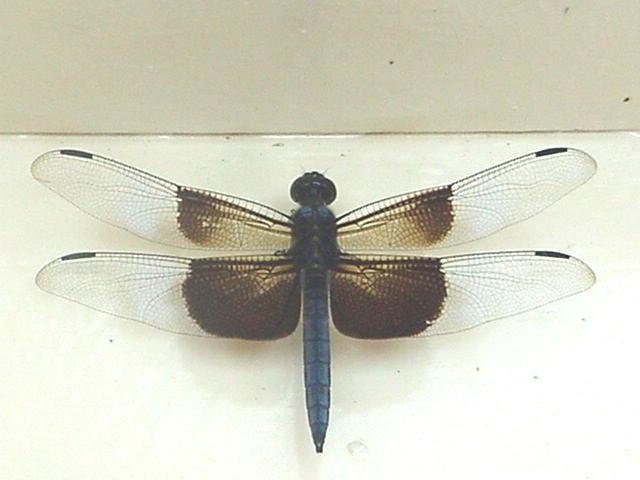 Other and more modern interpretations focus on the dragonfly as an old and adaptive insect or as an inhabitant of two realms, namely, air and water. So, according to this way of thinking, if you have the dragonfly as your totem (spirit guide, patronus), you may be emotional and passionate in early years, but gain more balance and control in maturity. The insects are also associated with creative imagination and our calling to reflect the light of the divine image in us. They stand for the power to gain vision, to change and grow. Whatever they may mean, they were a gift from God to me that particular day. The sight of them filled with me with joy, hope, and excitement. They came unbidden and unexpected, and I only saw them once more, the next day. But that’s how the gifts of God are. He grants what we need for the moment, whether a marvelous sight or extraordinary boldness, strength to keep going or sudden insight into a difficult problem. Indeed, he is as gloriously unpredictable as the flight of a darting dragonfly reflecting the light of the sun. I’ll be taking a break for at least the next two weeks.